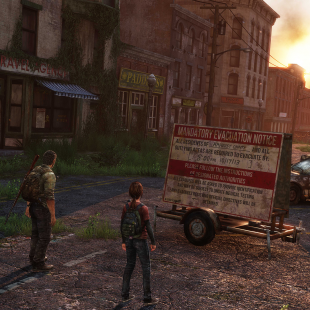 Back in March, The Last of Us's creative director Neil Druckmann confirmed that a film version was in the works and that it would be an adaptation of the story told in the game. Now, in the midst of San Diego Comic-Con's bombardment of nerd news, Druckmann and company have emerged again with new details about the film. Speaking at the Sony Screen Gems panel, Druckmann re-confirmed that the film version was in the works and that he will be writing the script while Sam Raimi (Evil Dead, Spider-Man) will be working as a producer. Raimi, who was also among the panelists, revealed that he had already convinced Druckmann to drop some proposed ideas for plot changes and to instead just focus on recreating the original story, especially its opening. While no formal cast was announced, it was revealed that actor Maisie Williams (Game of Thrones) was being considered to play Ellie and that the production would "find some place" for repeat Raimi veteran Bruce Campbell. Druckmann will apparently also be selecting the director and affirmed his desire to find the right actor for Joel to help the film avoid becoming a "poor imitation of the game." Sadly, according to Raimi, the movie "won't come out for years." Granted, that might not be the sort of timeline fans were hoping for when Druckman teased this announcement yesterday, but even so, it's good to see things moving forward.